Hostal Persal is located in the heart of Madrid, in the city’s historical centre and, for this reason, it is surrounded by shops, restaurants, museums, theatres and all the most important points of interest, some of which we will mention and explain below. The exact address of Hostal Persal is: Plaza del Ángel, 12 (between the Palacio Real and the Prado Museum). You will find us in an important pedestrian area in the centre of Madrid, accessible by foot or by taxi. Getting to Hostal Persal is very easy. Walking around its surrounding area is a very pleasant experience and you will have everywhere a short walk away. Also, it is excellently communicated by public transport, because the Sol metro and train station is right next to it (250 yards), as is the Atocha train station, barely 800 yards away. Also nearby are the metro stops Sevilla, Tirso de Molina and Antón Martón. To get around with one of these public transports, check out the official Madrid Metro and RENFE trains websites to prepare your route. Another practical option is to get around by bus. There are many bus lines that go into the city centre and many of them stop at Plaza Jacinto Benavente, very close to the hotel. Those are: M1, 6, 26, 32, 50, 65 M1, L1, N17. Check out the EMT page to learn the routes and decide which itineraries are best for your stay in Madrid. < Estimated duration: 30 mins. < In the airport’s T4 terminal, take the Cercanías train to Chamartín (Line C1). Once there, take the C4A, C4B or C3 train lines that will take you to Sol, from where you can walk to the hotel. < Estimated duration: 50 mins. Frequency: 24h a day, every 15 minutes (from 6am to 11.30pm); and every 35 minutes (from 11.30pm to 6am). From Atocha station, take Calle Atocha to Calle San Sebastián (800 yds.). Turn right to Plaza del Ángel (50 yds.) and turn left to Hostal Persal (50 yds.). Close to Hostal Persal you will find all the facilities you need to park your vehicle. The nearest car parks to the hotel are: Plaza de Jacinto Benavente, Plaza de Santa Ana, Plaza Mayor and Plaza de las Cortes. You will get a voucher in reception that you hand in along with your ticket at the car park’s payment point. The discount will be applied immediately. You obtain it directly. Once you have parked your vehicle, go to the car park’s payment point with your ticket and request the ticket for 3 or more days. Hostal Persal is located in Plaza del Ángel, which carries this name due to the paintings of the Guardian Angel that used to be on its walls. This square is in the middle of Madrid and is the beginning of Calle de las Huertas. On this terrain they built the Palace of Los Montijo which held the social cafe of Fonda de San Sebastián. Also in this square Cafe Central opened its doors in the late 19th century / early 20th century. Known worldwide and a must-see when in Madrid, it has many important buildings, such as Casa de Correos, which presides the square. Easily accessible by foot from Hostal Persal, Puerta del Sol was built by Ventura Rodríguez by order of king Carlos III in 1760. It also holds the famous Kilómetro 0, the starting point to all radial roads in Spain. 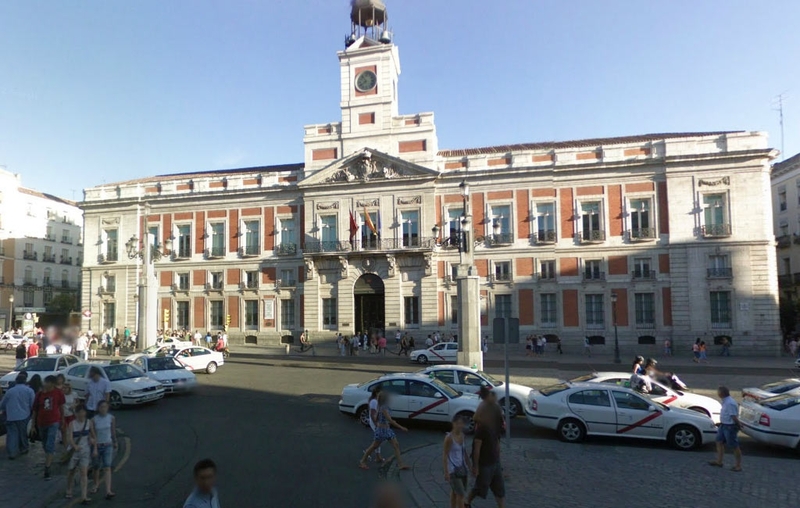 Today, it is the headquarters of the Autonomous Government of Madrid and where they celebrate New Year’s Eve. The tradition of the 12 grapes on the 31st of December taken on every stroke after midnight in the Puerta del Sol is a great tradition for many Spanish people year after year. In the square you can also find important statues such as the Bear and the arbutus, the symbol of Madrid; or the Mirablanca statue. Two blocks away from the Puerta del Sol is the Plaza Mayor of Madrid, one of the oldest in Spain which dates back to the 16th century. 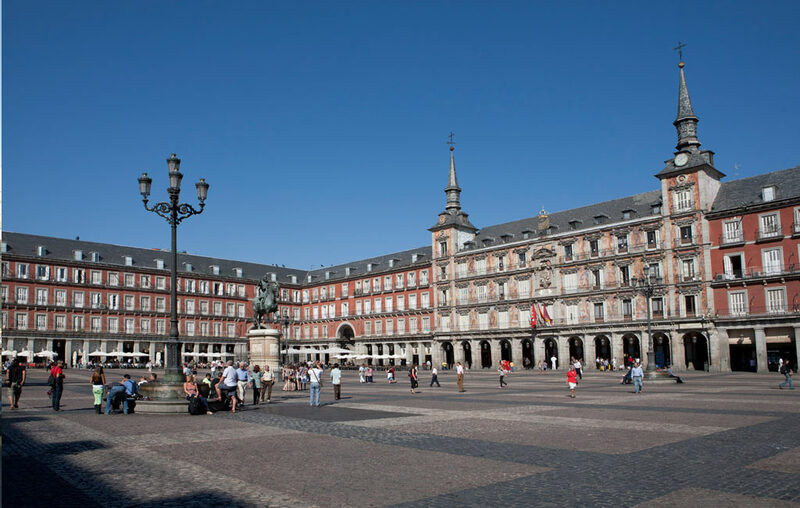 With porches and of large dimensions, the statue of king Felipe III stands out in the middle of the square. With a lot of history and filled with details, it has nine access gates of which the most famous one is the Arco de Cuchilleros, in the south-western corner of the square. It is surrounded by bars and restaurants where you can sample the traditional local cuisine and where tourists and young people gather; there is always something going on in Madrid’s Plaza Mayor. At Christmas, the most famous Christmas market in the city fills the square with stalls where you can buy little figurines for your nativity scene as well as home decorations and Christmas trees and their decorations. In the centre of Madrid, this district of cultural reference in the whole of Spain has its own identity. Shopping? Culture? Tourism? 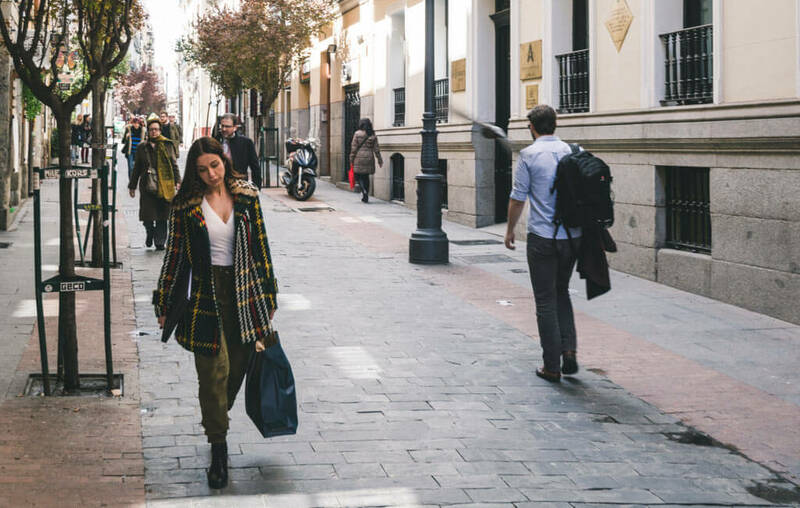 Around Hostal Persal, in the Barrio de Las Letras district you will find many options for leisure, from traditional ones to the most innovative ones. 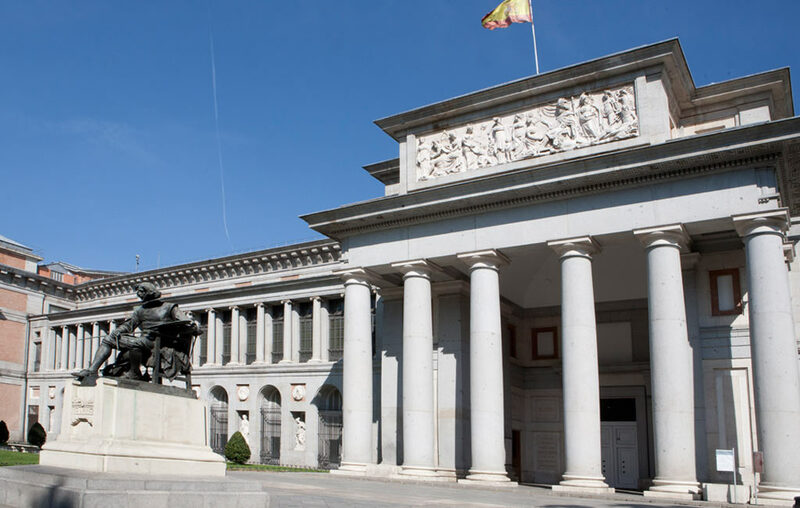 Barrio de las Letras, also known as Los Literatos, has some of the most famous museums in the world: Prado, Thyssen-Bornemisza, Centro de Arte Reina Sofía… It is the so-called Axis of Art, a must-see on the route of the Habsburg Madrid-Plaza Mayor-Puerta del Sol. Entering this district is immersing yourself in Spain’s siglo de oro, the golden century. Step by step you will be able to read verses and prose by literary figures like Francisco de Quevedo, Calderón de la Barca or Lope de Vega among others. Other points of tourist interest in the area are: the Ateneo, the Royal Academy of History, the house of Lope de Vega, the Church of San Sebastián (where Lope de Vega is buried) or the Convent of the Trinitarian (where Miguel de Cervantes, the writer of Don Quijote, is buried). Emblematic places such as Café Central, a stone’s throw from Hostal Persal, are part of the district’s idiosyncrasy: the best live European jazz performed there will thrill all good music lovers. 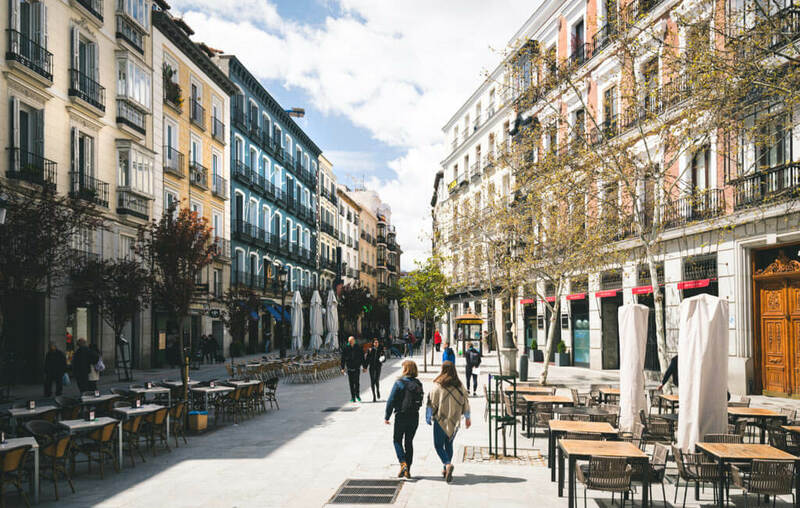 The Barrio de Huertas district is one of the oldest areas of Madrid and one of the busiest leisure spots in the Spanish capital. Cradle of past times of writers such as Miguel de Cervantes, Lope de Vega or Francisco de Quevedo, today it is a district that gathers theatres, breweries, tapas bars, restaurants and pubs among others. It is one of the best areas in Madrid to have a few drinks and enjoy an entertaining nightlife among friends. The most famous part of the district is Plaza Santa Ana and Calle Huertas, very close to Hostal Persal. The district goes from the Puerta del Sol to Calle Atocha and goes down all the way to Paseo del Prado. It is located next to Barrio de las Letras and it is next to the Spanish Parliament.